Human FKBP12, His Tag (FKA-H5122) is expressed from E.coli cells. It contains AA Met 1 - Glu 108 (Accession # AAH05147). The protein has a calculated MW of 12.8 kDa. The protein migrates as 13 kDa under reducing (R) condition (SDS-PAGE). Lyophilized from 0.22 μm filtered solution in 50 mM HEPES, 150 mM NaCl, pH7.5. Normally trehalose is added as protectant before lyophilization. Human FKBP12, His Tag on SDS-PAGE under reducing (R) condition. The gel was stained overnight with Coomassie Blue. The purity of the protein is greater than 95%. Peptidyl-prolyl cis-trans isomerase FKBP1A, a member of the FKBP-type PPIase family and FKBP1 subfamily, is also known as FK506-binding protein 1A, immunophilin FKBP12 and 12 kDa FK506-binding protein, which contains one PPIase FKBP-type domain. 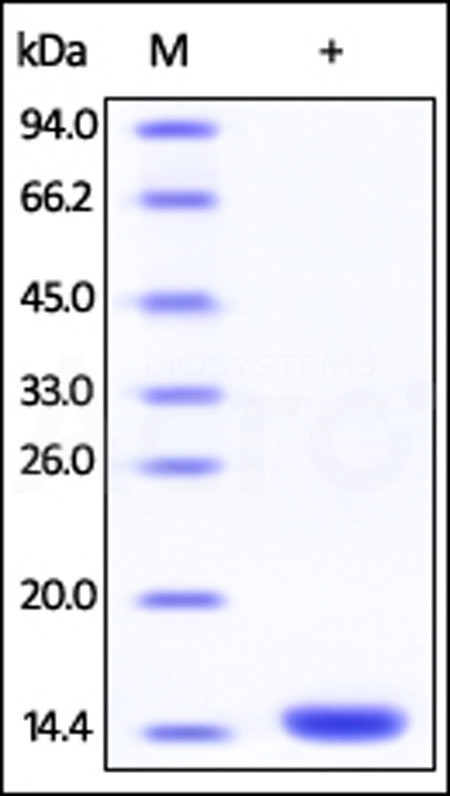 FKBP1A is a cis-trans prolyl isomerase that binds the immunosuppressants FK506 (tacrolimus) and rapamycin (sirolimus).FKBP1A interacts with several intracellular signal transduction proteins including type I TGF-beta receptor. FKBP1A can also interact with multiple intracellular calcium release channels including the tetrameric skeletal muscle ryanodine receptor. Furthermore, FKBP1A can recruite SMAD7 to ACVR1B which prevents the association of SMAD2 and SMAD3 with the activin receptor complex, thereby blocking the activin signal. (1) Siekierka J.J., et al., 1989, J. Biol. Chem. 265:21011-21015. (2) Michnick S.W., et al., 1990, Science 252:836-839. (3) van Duyne G.D., et al., 1990, Science 252:839-842.